The self-assessment workbook helps members self-assess their performance against the RJC Code of Practices (COP). It is like an internal audit you conduct of your business, to help you prepare for the third party independent audit needed to achieve RJC certification. 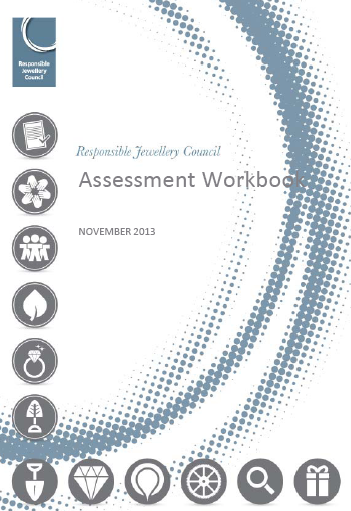 What is the RJC self-assessment? The exercise helps you prepare for the audit by carrying out a self-assessment against the RJC COP available in the Document Download Centre on the right. If you do not conform with any particular provision, you will need to review your systems to bring them into conformance before the audit: the RJC can help, see contact details below. When completing this workbook you are asked to rate any non-conformances you find as either 'major' or 'minor'. Major non-conformances apply to situations where your business has not identified and not implemented legislative or regulatory requirements relevant to the COP, and/or there has been an inadequate attempt to fix the situation, and/or this situation has the potential to result in an imminent risk to workers, the community or the environment. Minor non-conformances apply to situations where there is no imminent risk to workers, the community or the environment and some attempts have been made to fix the situation. RJC recommends that you also carry out a risk assessment for all applicable areas of the COP, to understand the risks facing your business and help you conform with many COP provisions. Please ensure you do this with adequate time to fix any areas of non-conformance. We recommend at least three months to complete the self-assessment. Define your certification scope, by identifying those parts of your business which actively contribute to the diamond and/or gold jewellery supply chain. Certification scope definition: The certification scope is defined by you, the member, and must cover all entities/facilities that are: – owned or controlled by your organisation; and – actively contribute to the diamond and/or gold jewellery supply chain. Any facility or business activity that meets both of these criteria MUST be included in the certification scope. Review your business practices against the requirements of the RJC COP. This provides you the opportunity to identify any areas where you don’t fully meet the requirements of the COP and address them in advance of the audit. These are only suggestions and members may of course adopt different management approaches, appropriate to their own business and circumstances. The key is to have an effective approach in place. Auditors will look for evidence that the approach used by the business can consistently deliver the requirement of the standard. Please go to the COP training page for more information and guidance. If you decide not to do the self-assessment, audits may be more time consuming, expensive, and have a much greater likelihood of finding non-conformances. Your auditor will not be able to help you prepare for your RJC audit as this would be a conflict of interest. You are able to complete the self-assessment without the need for a consultant, the RJC has a dedicated Training Manager, Maria Mursell who is on-hand to help you complete the self-assessment and prepare for your audit. Simply call +44 (0)207 321 0992 or contact Maria via email using the button below. Do I have to conform with every provision in the COP? You may consider some issues in the COP to be of low risk to your business because of the type of business you are (eg provision 22 on environmental management if you are a diamond trader). Regardless of the risk level, these provisions apply to all members, and you will be asked during the audit to demonstrate how you conform with the provision. More information can be found in the self-assessment workbook itself. Are some provisions more important than others? Yes. Some provisions are identified of as ‘critical’ importance to the integrity of the COP, due to the severity of the issue. If your auditor identifies a major non-conformance for a critical provision, it will be considered as a ‘critical breach’ and the auditor will stop the audit and immediately notify the RJC, who will begin disciplinary proceedings. If I abide by the law, do I automatically conform to the RJC COP? No. 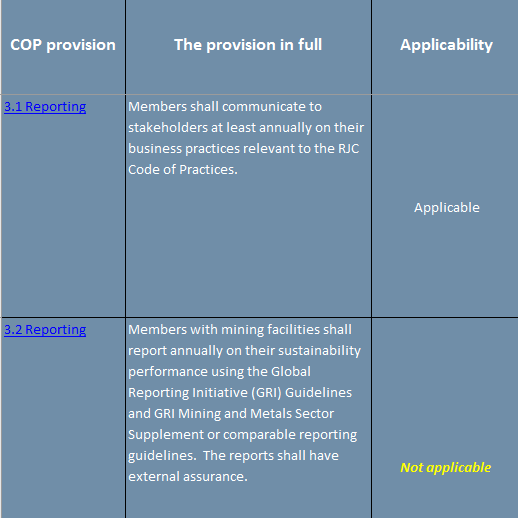 The requirements of the RJC COP goes beyond legal compliance in some countries. That means that even if the applicable law that you conform with is very strong, you may not be doing enough with just that to achieve RJC certification. Make sure you read each provision and guidance carefully before claiming conformance. Do I have to develop a different policy for each RJC COP provision? No. In many cases you can develop policies and systems that cover more than one topic, for example a human rights risk assessment or human rights policy could also cover the risks of child labour and forced labour. Must all my processes and systems be documented? Not necessarily. The RJC acknowledges that you may have processes and systems in place without keeping formal records of them, especially if you are a small business (fewer than 25 employees). Don’t worry: if this is the case, auditors can usually find another way to evaluate your systems (for example, by interviewing employees). For larger organisations, it is usually expected that procedures are documented and records of compliance are maintained. Please note that we have some guidance on the documents auditors may need to review. Please see audit page for more information. Can I use a consultant? You can. It’s not needed or required, but we understand there are circumstances when a member may want/need outside help to prepare for the RJC audit. We believe that members see more value from their RJC certification if they’ve been involved in embedding our requirements into their company directly – this can be harder to do, and harder to keep going, when a consultant is used. If you would like to use a consultant, RJC has curated a list of Topic Experts. Information can be found on our website, here. The use of consultants and/or consulting companies shall be outlined in the audit report written by auditors in cases where they were used by members, and identify if they were present during the audit. The RJC has a dedicated Training Manager, Maria Mursell who is on-hand to help you complete the self-assessment and prepare for your audit. 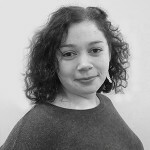 Simply call the RJC London office on +44 (0)207 321 0992 or click the button below to get in touch with her via email.